We are properly into summer now with the searing heat and increased humidity. However, the heat is different in Beijing. Because of the thick layer of smog, it feels like an oven and for the first time, I truly understand the meaning of the greenhouse effect. It's stifling, hot and above all, polluted. I don't envy the long distance Olympic atheletes come this August. To combat the average of 30oC and above temperatures, I've taken to light meals in the day. 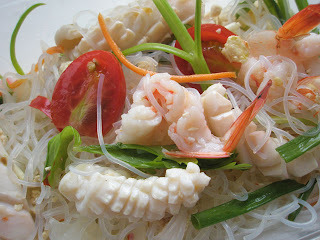 A regular feature is Thai Seafood Salad and the recipe I like is here. It's very basic and easily modified to suit one's personal taste. In this instance, I took away the fish and added in glass noodles and julienned carrots instead. And although the recipe advises one to serve immediately, I normally chill mine for up to two hours before consumption. The opposing sensation of cold and spicy hot (don't let the tame appearance fool you, your tongue will burn) is something to be reckoned with. I'm going to make this for my office lunch, gee..looks calories friendly also. I haven't tried this tho but I'm with you there, in this heat, all I can manage are salads these days. chicchicbaby: It is calorie friendly. You can even afford to chuck down a thick slice of chocolate cake afterwards. LOL. 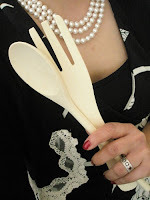 petite fleur: Has this ever happened to you? It's so warm you completely lose appetite?